The Tales Of Tori: Dentist Dress Up! So for work on Friday we decided to get dressed up and go all out for Halloween! This is why I love my job and the people I work with! 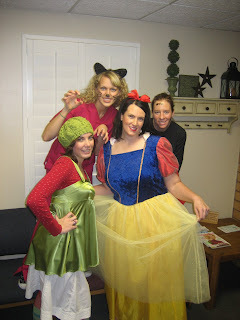 I mean honestly, where else could you find Snow White, an elf, a black cat and a dead Hygienist in the same building? It was such a fun day and I can't say enough just how much I love the girls I work with! I seriously get paid to have fun! :) Thanks for the party day gals! 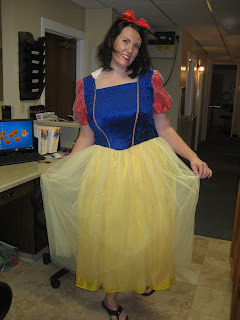 Christie as the glamorous Snow White! She should work at Disney! Sure miss you guys at work! Call me sometime to chat. Love ya! I sure love your office peeps too. At first I thought Jon was crazy for wanting to drive all the way to Kaysville to go to the dentist instead of just finding one down here. But after my first visit, I totally understand why! You work with such fun people! And I am so glad to see you back in the blogging world Tori! I hope everything is going well for you! Our office dressed up too. I haven't put up my pictures yet, but there was some pretty good stuff. 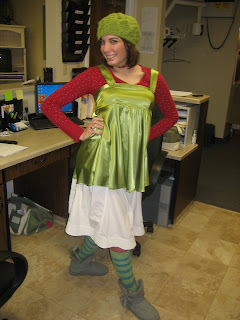 The best was our Office Manager in her 70's get-up. Check back in a few days and hopefully I'll have them up. Who is that awesome person dressed as SSC? I mean an elf haha. I love ya Tor! I know, I know! You're strawberry shortcake, not an elf! haha! At least admit you look like one! :) Love ya too, girl!